Karin learned early on in her career that the quality of services provided depends heavily on how engaged the people are. She then read a lot about different businesses, including the life-changing book by Ricardo Semler, Maverick! which influenced her views on how work should happen. As Karin worked with different businesses, she drew on her coaching experience to help create a fundamentally different work environment. Karin shares her story of how she was able to help different businesses change from autocratic, dis-engaged work cultures to much more engaged and ultimately self-organizing work culture. She shares with us a tool she developed to help teams uncover the major obstacles to teamwork and collaboration, and tackle those obstacles effectively, leading to a culture of ownership, where teams discuss and solve the problems they have. As we dive deeper into the process of self-organization, we discuss coaching. Coaching as the process, and the perspective that enables self-organization. Karin shares the 5 different aspects she believes help teams walk through the steps towards self-organization. We, Scrum Masters, need to learn to enable self-organization in our teams, and the 5 different coaching aspects that Karin discusses can become our own roadmap to help our teams. We also discuss some tools that can help in our work, specifically the set of techniques under the title “Liberating Structures” that can help facilitate the team conversations and meetings. Finally, we explore other resources and sources of information for those interested in self-organization and self-organizing teams. 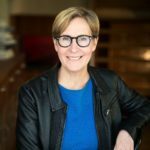 Follow Lisa Gill on medium, Karin’s partner at Tuff Leadership a company that helps teams with hands-on, practice-centered leadership training. Lisa also hosts a podcast on self-organizing leadership at the Leadermorphosis podcast. Karin has been working with self-organization as a way to help teams improve performance even before Scrum was in the picture. I met up with Karin in Sweden in 2018 and got very interested in her work regarding the coaching way and self-organizing teams. Karin got Inspired by studying service management and reading books by Ricardo Semler. Thanks to that she developed a radical, practical way of developing, organizing and lead companies and workplaces that allow groups of employees to impact and take charge of the business they are involved in. This approach creates extraordinary results. You can link with Karin Tenelius on LinkedIn and connect with Karin Tenelius on Twitter.